Realizing and sending your email campaigns has never been so easy. Jackmail is both a WordPress plugin for newsletters and a professional routing server. Say goodbye at those emails going to spam. Our philosophy is quite easy to understand : sending newsletters must be easy. Keep control of your contact lists using your own email collect widgets or Jackmails one. For all your campaigns, you can either set them manually or try the automatic triggering. Choose the post’s category and the trigger mode and let the magic begin. Automatically publish every post, every 5 new posts or weekly, Jackmail handle it. Analyze the campaign results, improve your email campaigns efficiency and leverage the power of email marketing. Created and developed in France, Jackmail take benefits of a major and historic email actor expertise and infrastructures. 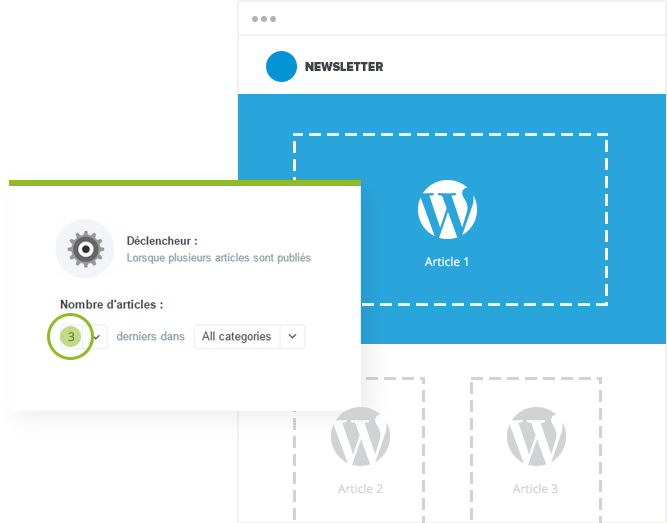 Jackmail is a tool made to help you create and send newsletter from WordPress. We offer free credits in exchange of your help for translating Jackmail ! The Regular license contains: plugin + support + 15.000 emails available 1 year. The Extended license contains: plugin + support + 60.000 emails available 1 year.